Momma's Restaurante in GTA III. Momma's Restaurante (also called Cipriani's Restorante or Ristorante Italiano) is a restaurant located in Saint Mark's, Portland, Liberty City. The restaurant has been in business since 1968 and is run by Ma Cipriani. Ma lives at the restaurant and her son, Toni, moves in between 1998 and 2001. The restaurant is frequented by Leone Family gang members, including Salvatore Leone. 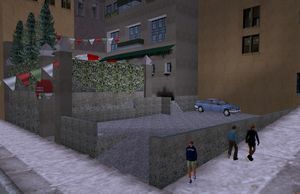 The restaurant is the starting point for Ma's missions in Grand Theft Auto: Liberty City Stories, Toni's missions in Grand Theft Auto III, and Vinnie's missions in Grand Theft Auto Advance. Momma's Restaurante in GTA Liberty City Stories (1998). An advert for Momma's Restaurante in GTA III. Momma's Restaurante in GTA Advance. This page was last modified on 11 March 2017, at 15:33.